Dental implants are one of the great benefits of advanced dental technology. A dental implant is a permanent replacement for a missing tooth and is a great option for people want to restore their smile. Implants don’t just restore the aesthetic appeal of your smile, but they improve functionality as well. 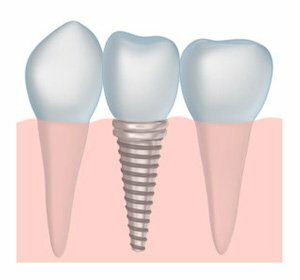 Dental implants consist of a titanium post placed in the jawbone to provide stability for the replacement tooth. The post acts as an anchor for the artificial tooth to be placed. Your new dental implant won’t slide or slip, giving you the ability to chew and speak with a beautiful new smile! Provides Support | A missing tooth can cause bone loss in the jaw over time. The longer your tooth is missing, the more deterioration takes place. The roots of a tooth help keep the jawbone healthy by encouraging bone growth and good oral health. Dental implants can create the same effect a natural tooth would, increasing the health of your jawbone and restoring strength and support. An Anchoring Point | A dental implant doesn’t just improve the health of your jawbone. Dental implants are used as anchors for different types of restoration, including dental bridges, crowns, and implant-supported dentures. When you receive a dental implant, you will need to allow time for healing and proper integration before receiving the replacement tooth. Our team at Canyon Echo Dental is experienced in getting the right look and fit, whether it’s for a dental crown or for implant supported dentures. We love watching our patients transform and to see the positive impact a dental implant can have on their lives. We want you to have your life back, and your smile back. For answers to more questions about dental implants and the continuously advancing dental technique, call our office today.